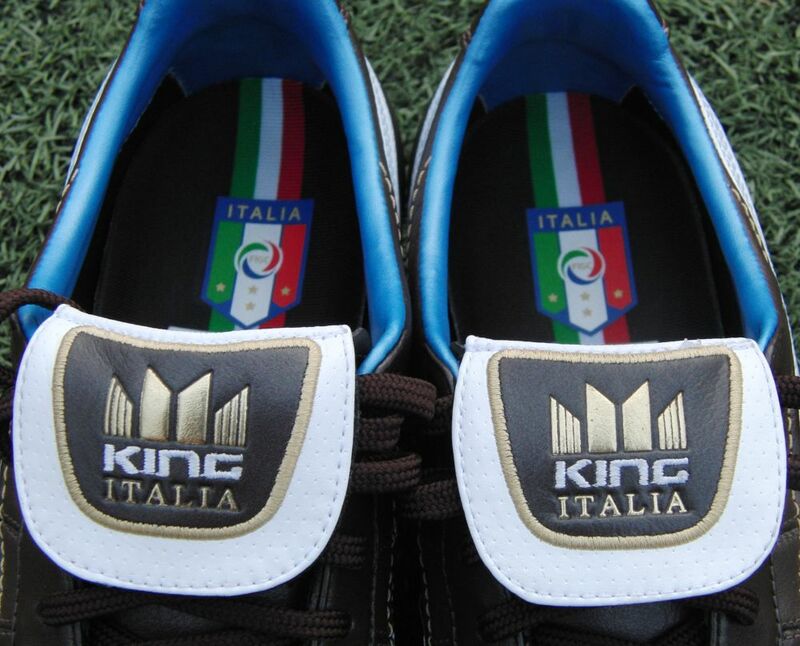 The release of the Puma King XL Italia celebrates two unique events. First of, the fact that the Puma King soccer cleat has graced the market for over 40 years, and second is a celebration of Italian soccer, and in particular double World Cup winning coach Vittorio Pozz. The XL Italia has a very distinctive and unusual look that signifies the heritage of the Italian national team. They come in a Brown/White/Blue color. At first glance, the brown, blue and gold tones that cover the cleat, grab your attention and ooze class. I have to admit that I am a fan of how these cleats look, it is very unusual to see the colors used, but it is kind of refreshing. I had an opportunity to test out a pair in size 9US, for the past month. During that period, I wore the King XL in 2 games and 5 training sessions. Here are my thoughts. Even though these boots look super classy when you first take them out of the box, there is a stiff fell about them that gives the impression they might be tough to break in. As it turns out, this is true in some respects. 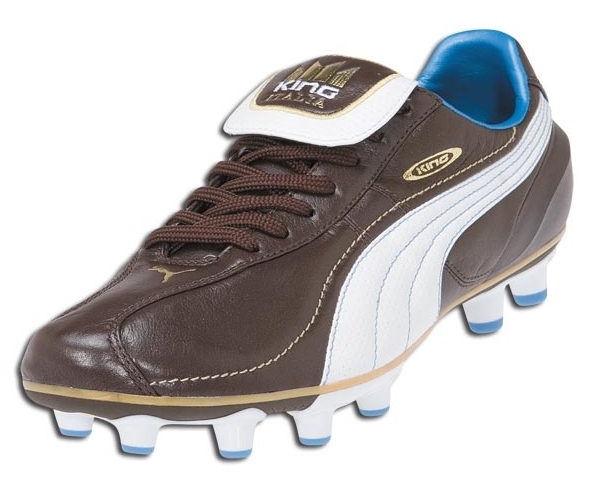 Puma use a full grain leather upper that feels more tense or rigid than other K-leather cleats on the market. Another aspect that makes them a little tougher to break in is the sole. There doesn’t seem to be a lot of flexibility or movement. This concerned me going into the first practice session, but surprisingly, they were super comfy from day 1. It did take a few training sessions for them to really break in and soften up. But when they did, what a result! The cleat contours to your foot, and you can tell that the leather is high quality. This is probably one of the main reason the King has been around for so long. I encountered no blisters or cramping, and other than the initial stiffness the cleats performed really well. Well, first off is the color choice that Puma use. The main brown color is very unusual for any cleat on the market. The sky blue used around the ankle area also adds an extra dimension, and the colors compliment each other. 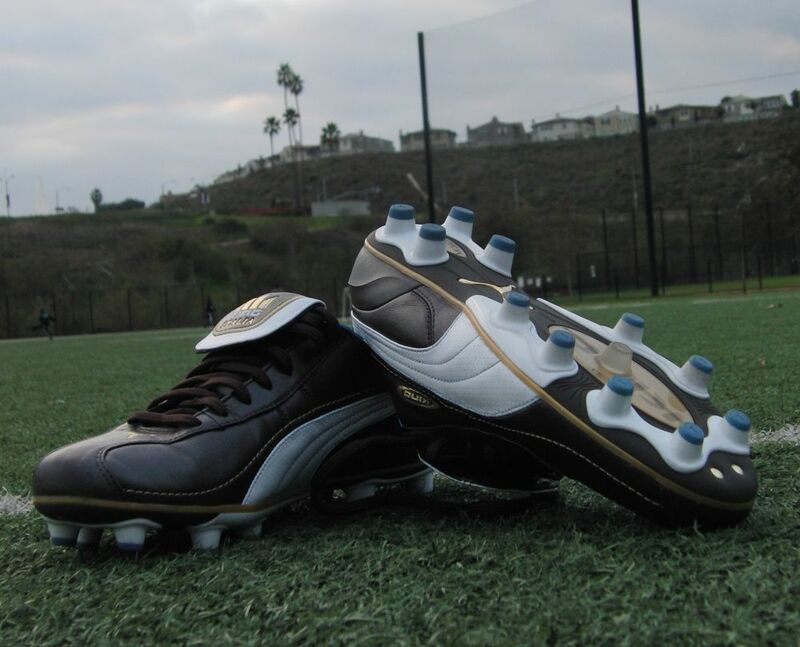 These cleats hold some of the unique features seen on the original Puma Kings, like the toe overlay and the bead line between the upper and outsole. The toe overlay is clearly visible, and to be honest it is something that I am not fond of. The overlay seems to raise the toe area, making it more of a round shape than a straight line towards the toe. One thing I have to compliment Puma on is the tongue design. Lying over the laces, the tongue looks very old school, but unlike some similar designs recently released on the market, it has Velcro that keeps it in place. The Velcro is strong enough to keep the tongue down all the time. The Puma King XL Italia fits true to size, actually they are an absolutely perfect fit! I am a size 9US and I tested a size 9US. If you do buy yourself a pair do me a favor and try putting them on barefoot (ie. no socks). You are not going to find many other cleats that are as smooth inside, they are super soft and you will be able to tell right away that breaking them in will be a lot of fun. The cleats are officially slated to be 11.05oz, which would leave them at the mid to higher range weight wise. But to be honest, when you put them on, this is not very noticeable. Puma also use technology in the sole called AptoLast that conforms to your foots natural contours, offering a super snug fit. This was something that I noticed by the 3rd training session, and continued through the rest of the testing. 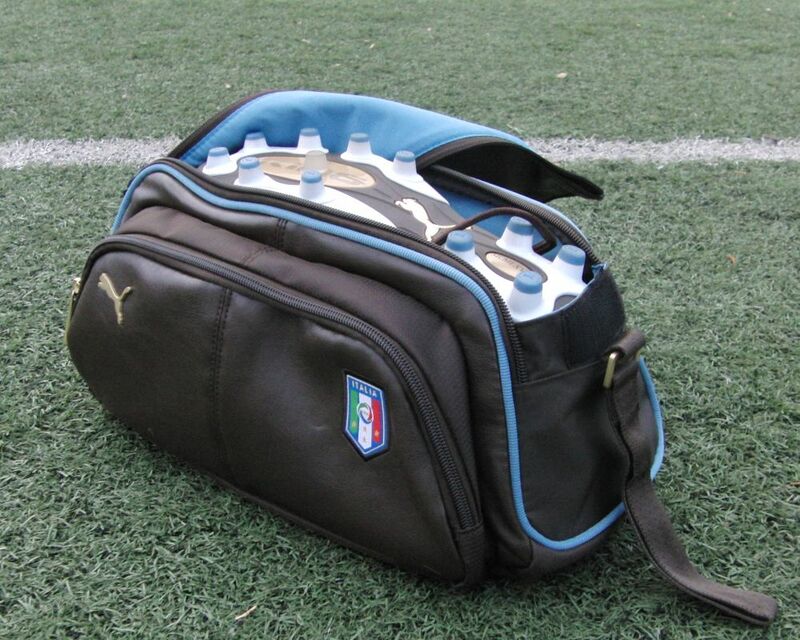 Puma have included an awesome boot bag and cleaning kit with these cleats. The bag comes in the same chocolate brown color as the cleat, with the ‘King’ emblem and dates ‘1968-2008’ printed on one end. There is a side pouch that contains 2 cleaning brushes, a tin of leather food, and a shining cloth. To be honest, the boot bag is a collectors item on its own without the cleats. And I was extremely impressed with how Puma put together the package! I think I have discussed what I deem to be the negatives above. First, the fact that they stiff starting out. I am happy to report that once they are broken in, these cleats rate positively against the market! The other negative is the toe overlay. Some people like this, but personally I prefer cleats the angle straight towards the toe, rather than in a rounded fashion, it can make for an awkward feel on the ball. This is a great little package! Puma have continued the Puma King tradition, while at the same time celebrating the history of Italian soccer. In terms, I see more defenders wearing Puma King’s more than any other position. They seem to suit hard working, gritty players. If you are fast paced or a set piece taker, these might not be the right choice for you. It did take some time for these cleats to break in and the design of the toe makes them slightly clumsy. If you want to see these cleats in action, keep an eye on the upcoming African Nations cup, where Puma are first choice for many of the players. Right now, you can get your hands on a pair (compared to the original $142 price tag), and include the fact that these have a sweet boot bag and it is a sweet deal. what size should i get these? always loved the Kings… but no way is durability a 10. It should be 5 or less. I've been buying the latest model available every year up until about a year ago, and one thing remains from year to year: The leather at the outside front separates from the sole in less than a season… 5 seasons , 5 different pairs, 5 separations. I don't normally care because I love the comfort/control with this boot, but anyone who doesnt want to blow $120+ a year should stay away. @Scott: Saying just that the boot lasted for one season doesn't mean much, how durable the boot is highly dependant on the amount of usage, the type and condition of the pitch (artificial grass wears off the leather way more fast than natural surfaces) and player's position. Every pro uses 10+ pairs of boots a season (though they won't wear them till the point of leather breaking off). Also one has to take care of the boot, wiping off the dirt, adding leather care, for the optimal durability. For me, as a goalkeeper, the part of the boot that wears off first is always the studs. Been using several pairs of Puma Kings FG (top mainly) and, for me, the problem has never been the leather. The thing has been the same with Adidas shoes, eg. one pair of World Cups lasting 4 pairs of studs till the insole of the boot broke apart, not the leather. @Tasos: For me, having avg maybe a little narrow feet, Adipure 3 at UK9.5 was perfect straight out of box and 9 felt too small, but after 2 months I feel (as the leather has streched a little) that I should had gone with a 9. Puma King XL @ 9.5UK was too big, 9 was a tight fit, but now after a while, they're perfect. Also, Adipure's sockliners are really thin as the Pumas are thicker. Out of the box with the same sockliners, I'd say Pumas at the same size are slightly bigger. It depends on how the upper loosens up. If the leather breaks in correctly, it should sit snug against your foot and not cause too many issues getting under the ball. Honestly, I wasn't too impressed with the overall performance of these boots.